Matthieu Faubourg - "A Long Way"
Pascal Viscardi - "Digital Illusion"
Review: Hailing from France but now based in Tokyo, Jazzy Couscous is a label that explores all kinds of sounds pivoting around the axis of jazz and deep house, but keeping things wide open for variety and experimentation. Following releases from Brawther, Klodio and more besides, it's time for a hefty various artists release that shows off a whole heap of talent. 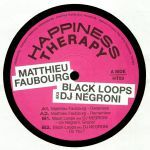 Matthieu Faubourg keeps thing pumping and Detroit-flavoured on "A Long Way", while Drezb smooths things out to a Chez Damier-influenced deep house groove. Pascal Viscardi gets things properly jacking on the deep-diving "Digital Illusion", and then the record closes out with the blissful ambient excursion of Midori featuring Victor Santoni's "Distance".